CLICK HERE to take the FISASCORE Estimator today and learn more about your organization’s information security risk. WHY IS A FISASCORE IMPORTANT? FISASCORE allows businesses and organizations to know and understand how they are vulnerable and how they compare with peers within similar industries. FISASCORE can also be used to communicate the level of information security risk to interested third-parties (customers, stakeholders, auditors, regulators, et al.). FISASCORE is constantly calibrated to the latest security threats used by attackers with controls designed to mediate those threats and protect data from unauthorized access, disclosure, distribution and destruction. The FISASCORE framework consists of a thorough evaluation of risks within four phases: Administrative Controls, Physical Controls, Internal Technical Controls, and External Technical Controls. ADMINISTRATIVE CONTROLS are sometimes referred to as the “human” part of information security and are controls used to govern other parts of information security. Common administrative controls include policies, awareness training, guidelines, standards, and procedures. PHYSICAL CONTROLS are the security controls that can often be touched and provide physical security to protect your information assets. Common physical controls include doors, locks, camera surveillance, and alarm systems. INTERNAL TECHNICAL CONTROLS are the controls that are technical in nature and used within your organization’s technical domain (inside the gateways or firewalls). Internal technical controls include things such as firewalls, intrusion prevention systems, anti-virus software, and mobile device management (MDM). EXTERNAL TECHNICAL CONTROLS are technical in nature and are used to protect outside access to your organization’s technical domain (outside the gateways or firewalls). External technical controls consist of search engine indexes, social media, DNS, port scanning, and vulnerability scanning. 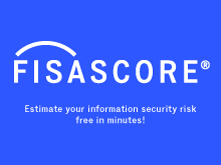 The FISASCORE Estimator now gives you the ability to get a free estimate of your FISASCORE that will help you get an idea of where your organization is related to the health of your information security. Every organization, big or small, should be aware of their most significant information security risks. FISASCORE will identify and address your organization’s risks through a standardized, consistent and efficient process that enables all members of your organization to quickly and confidently understand and quantify risks.